In part 1 of Coaching a Bad Attitude, we talked about the importance of having a job manual for every single employee. Often, employees with bad attitudes are also people who hold onto knowledge and power. A manual ensures that no one’s daily actions are a mystery, which means that everyone can be let go if necessary. In part 2, we discussed the importance of the coach having a positive attitude. Leaders are responsible for helping their employees create success. If we get adversarial with employees, we are ensuring a battle during the coaching. In part 3, we talked about limiting the conversation to observable behaviors. Proving a bad attitude can be a difficult thing. Now we are going to outline the best way to have a coaching session by using the Coaching Dialogue Outline. Let’s go through it step-by-step. 1. Before the Discussion. We’ve already talked about this step. We want to bring in a positive attitude and be clear on the outcome that we want from the coaching. Before the coaching session, we also want to consider what the challenges might be for the employee. Generally, the obstacles are ability, resources, or attitude. For employees with bad attitudes, the root cause may be that they don’t have the resources that they need to perform their jobs. If so, that’s something that we can fix as leaders. Perhaps they don’t have the needed skills and abilities for the job. If it’s a training issue, that one is also on us to fix. It’s important to consider possible reasons for the bad attitude, but it’s imperative that we don’t make assumptions. 2. Opening. In this step, we are face-to-face with the employee, and we are telling them what we want to talk about. It’s important to let your positive attitude and intention to be helpful shine out during this step. We can use the CAR format to help us stick to observable behaviors and business-based results. This is a good time to remind the employee and ourselves that this is a dialogue, not a diatribe. As leaders, we need to do more asking than telling. We are problem-solving together with the employee, not telling the employee what he or she needs to be doing. 3. Discover and Share. This is THE MOST IMPORTANT STEP! When we skip this step, we miss the information that we need to solve the problems and overcome the challenges. We, as leaders, want to make no assumptions and put all our preconceived notions aside. During this phase, we pretend like we know nothing and get really curious about what is going on. Remember, we hold onto our positive attitude while asking thoughtful questions. If we enter the discussion with an open mind, we are listening carefully and willing to change our minds about a situation. It is possible that the employee has a brilliant suggestion. We must put our egos aside and listen without trying to “win.” We all win when our employees are successful. Lastly, the conversation must include both facts and feelings. One way to bring feelings into the conversation is to name the feelings that we see and watch the employee’s response. For example, I could say, “Henrietta, it seems like this topic annoys you.” It could also be that she is fearful, upset, feeling disrespected, etc. If we don’t get it right, they will let us know, but we are getting to the heart of an issue when we discuss the feeling part of it. What obstacles are you facing? Have you faced a challenge like this before? If so, how did you deal with it? Do you see any patterns here? If circumstances were perfect, what would the situation look like? Is there a way to create those circumstances? 4. Develop solutions. This is the brainstorming step. We start by creating as many crazy solutions as possible. In the beginning, we sideline any reality checks. It’s fun! We are asking our employee to get creative. Then we start discussing the possible solutions that we’ve created, with an eye to what is realistic. Someone’s job might be a lot easier if we hired an assistant for him or her. However, that might not be the best solution for the organization. It can be helpful to discuss the difference between what is best for the employee and what is best for the team, group, or organization. They aren’t always the same. Maybe we can’t hire an assistant. Are there other ways to remove some responsibilities from the employee if he or she is truly overwhelmed? Sometimes great solutions begin with outrageous ideas. We want our employees to solve their own problems if possible. They will be more likely to follow through on their own ideas than ours. Also, they know more about their own situation and abilities. As much as possible, we want them to create the solutions. 5. Agree. We’ve done all the hard parts now. This step is just ensuring that we and the employee are on the same page. We want to capture what we’ve decided in writing. The summary below captures the things to consider in this step. 6. Close. And we are done! The last thing to do is to check in with the employee to see how he or she is feeling. Ideally, they are positive and excited about moving forward with the plan. That might be a bit much to hope for when coaching employees with a bad attitude, but we can express confidence in their ability to move forward and follow the plan. It’s a good time to remind them of the positive business outcomes that everyone will receive as a result in the change in behavior. The conversation is complete, but the coaching is far from done. Next time we will discuss the bigger picture – the Coaching Cycle. For a little bit of fun (and free) leadership development, join 53 Leadership Challenges at KathyStoddardTorrey.com. Want to go further with your professional development? Check out the courses offered at PositiveEffectLeadership.com. It took me a while to appreciate the power and beauty of this conversation outline. At first I thought that having a structure for a discussion was unnecessary. Boy, was I wrong! This guide keeps the conversation on track, ensures everyone has input, creates more options, and fosters positive relationships. Impressive! Open. We open a conversation simply by stating what we are going to talk about. It helps the conversation stay on track. Discover and Share. This is the most important step in a conversation. We often skip this step and move straight to positional arguing about the best thing to do. In Discover and Share, we take time to listen fully by being completely present and listening for understanding. We pay attention to the words being said, tone of voice, facial expressions, and body language. We are curious about everything and ask a lot of questions. Giving focused attention to someone is a gift. We don’t often feel like we are in the spotlight of someone’s attention, even though we like being seen and heard. Finding out how the other person or people view the situation creates more possible solutions and helps to maintain positive relationships. We also share our perspectives and feelings during this step. Develop Solutions. Once we have all the facts and feelings on the table, brainstorming begins. I see it as a funnel that begins with a wide variety of options and slowly narrows down to the best choice. During this phase, it’s important to continually ask what is best for the people involved in the decision – whether that is a couple, a team, a family, or an organization. Agree. 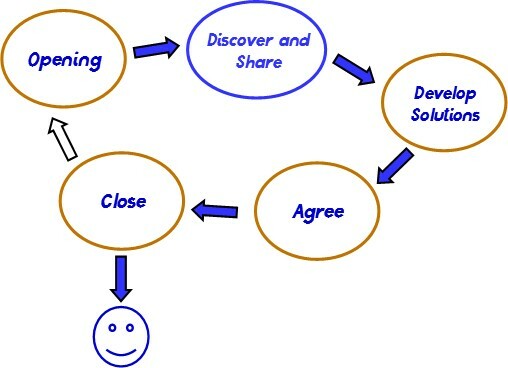 If we’ve done a good job during Discover and Share, it’s easier to come to an agreement. Close. We check to make sure everyone is on board and explicitly state the agreement. It’s also a good time to check in one last time on how everyone is feeling about the agreement. When having a conversation, focus on the Discover and Share step of the conversation. The other steps happen naturally and don’t need as much emphasis. The information needed to resolve conflicts never comes to light if we jump straight to developing solutions without fully listening and understanding each person’s perspective and feelings. It’s totally worth the time that it takes to be sure each person feels listened to, understood, and respected. For a little bit of fun leadership development, join 53 Leadership Challenges at KathyStoddardTorrey.com. If you are interested in taking your career to the next level quickly, contact me for a sample coaching session at KSTorrey@tapferconsulting.com.